For optimal health results, it's important to develop a medication schedule that fits within your daily routine. Becoming accustomed to a regular schedule prevents the likelihood of missing a prescription dose, or taking double doses. If the medication time frame was overlooked, or pill was not taken altogether, contact your physician for immediate guidance. Certain medications allow for individuals to take the missed dose at anytime within a 24 hour period, while other pharmaceuticals may cause harm if two doses were taken consecutively or within a close timeframe. It's important to contact your physician, so they can guide you accordingly. A side effect of blood thinners is prolonged bleeding time. This means it may take longer for your blood to clot when experiencing a wound, laceration, or injury. Your physician may order blood test to see how fast or slow your blood is clotiing. These tests inlcude PT (Prothrombin Time) and INR (International Normalized Ratio), and aPTT (Activated Partial Thromboplastin Time). Depending on the blood results, the physican prescribes the adequate dose to meet your healthcare needs. The Cleveland Clinic recommends electric razors, soft toothbrushes, and gentle flossing as preventive measures for patients taking Coumadin or other blood thinners. It's also advised not to engage in contact sports like football and wrestling. New medical advances and drugs are on the rise. 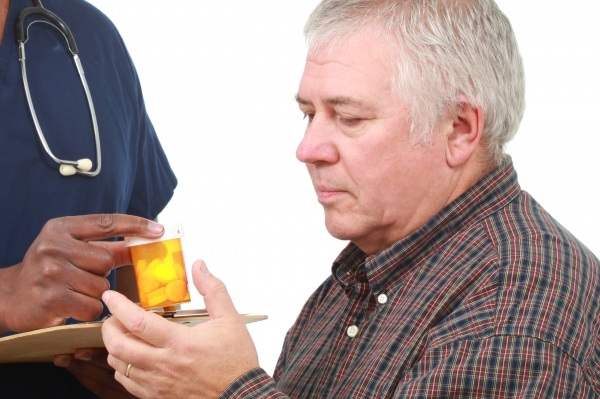 Getting educated on prescribed medications is a must. Several individuals have more than one physician and specialists who prescribe them medications. At times practitioners fail to communicate with each other, and patients end-up with similar prescriptions to those already in their treatment plan. A good tactic is to keep a current list of all your daily medications, and bring this document to each doctor's visit. Also, pharmacists are great resource, which are available free of charge to the public. These professionals address questions, concerns, and inquires on any particular prescription. Monitor for signs of bleeding and oozing (pinkish-red colored secretions) in the skin, urine, stool, saliva, and sputum. These are signs of internal or external bleeding, which require medical attention. The Cleveland Clinic lists the following side effects one may encounter when taking blood thinners: Abnormal headaches, stomach and abdominal pain, unusual pain and swelling in the joints, purplish spots on the skin, feeling tired, pale complexion, and sudden changes in vision. Excruciating pain and excessive bleeding requires immediate action, if you are experiencing these symptoms report it to your physician and call 911. Some foods can decrease the function of blood thinners, while other foods increase the potency. Foods high in Vitamin K, such as broccoli, spinach, and other green leafy vegetables counteract the effectiveness of Coumadin also known as Warfarin (a commonly prescribed blood thinner). Vitamin K promotes blood clotting, and if consumed in the diet it offsets the effects of Coumadin. Ask for a nutritional consultation, and educational resources for individuals starting on blood thinners. The Cleveland Clinic suggests individuals who are taking blood thinners to refrain from consuming grapefruit, green-leafy vegetables, liver, green tea, black tea, alcohol, and herbal products such as Gingko Biloba, Garlic, Ginger, and St. Johns Wort. These are five essential tips to keep in mind when starting a medication regimen with blood thinners. I hope this serves as guidance and assistance through your journey in wellness and health. Please feel to contact me with any further questions. *The information discussed in this article is for educational purposes only. Please consult with your health care provider prior to putting any suggestions into practice. What’s hyperlipidemia? How Can I Prevent it? Thanks for your feedback, and for sharing that information with us. Keep in mind that medication doses for many blood thinners are based on lab values, as well as reported signs & symptoms from the client. Physicians commonly order routine labs to monitor clotting factors like PT, PTT, INR, and platelet count, yet symptoms like prolonged or excessive bleeding (outside of the therapeutic range) are ways of alerting both patients and healthcare practitioners of needed changes in the plan of care. If someone is on blood thinners it’s recommended to apply pressure to the injured site for a few minutes, which should be sufficient to stop the bleed. If bleeding continues or becomes perfuse, then it’s best to seek medical attention. Thank you for the response. I agree it is better to treat the cause rather than the symptom. I guess since I can't predict what could happen and I'm not a doctor it makes me feel better that she has something like this (qwick-aid bandage) nearby, just in case - it just takes one nasty fall or accident to cause a bigger problem:/ Do you have any recommendations for any natural remedies instead of a pharmaceutical like Coumadin? She says she gets dizzy sometimes and that seems to be a common sideffect. Thank you! Depending on the client's underlying condition, his/her physician prescribes specific medications for optimal therapeutic response and disease management. Over the Counter (OTC) products may not always meet the therapeutic requirements, and many contain ingredients that interact with other medications. If the client is experiencing dizziness, it's best to notify the doctor for further guidance. I would advise the client to take their time when getting out of bed or when changing from a sitting to a standing position. Sudden movements after prolonged periods in one position can cause dizziness and falls. If the client is experiencing dizziness it's also advised not to drive or operate heavy machinery. Thank you for your response.